Hello everybody! I hope you guys are well. So today I starting cleaning toys because it’s been a while and there’s a lot to clean. There’s about three toy bins, a doll house, a pretend kitchen, bookcase with electronic toys, and a big playhouse full of stuff animals. Yes, my apartment sounds and looks like a day care center. I can’t wait until I can claim my living room again. 🙂 Oh, I almost forgot, and believe me I try, we also have a folding slide, a small basketball hoop stand, and a small bench table. All this for two little girls and of course the second I start cleaning, for example a toy bin, they want to start playing with all the toys inside. It never fails. That was the pattern today with my youngest, Sophia. I started cleaning the play kitchen, she decided it was cooking time. I went to the doll house next. Here comes Sophia wanting to play house and by the way I tried to play with her and she didn’t let me. 😦 Oh well, back to cleaning. Lucky me. 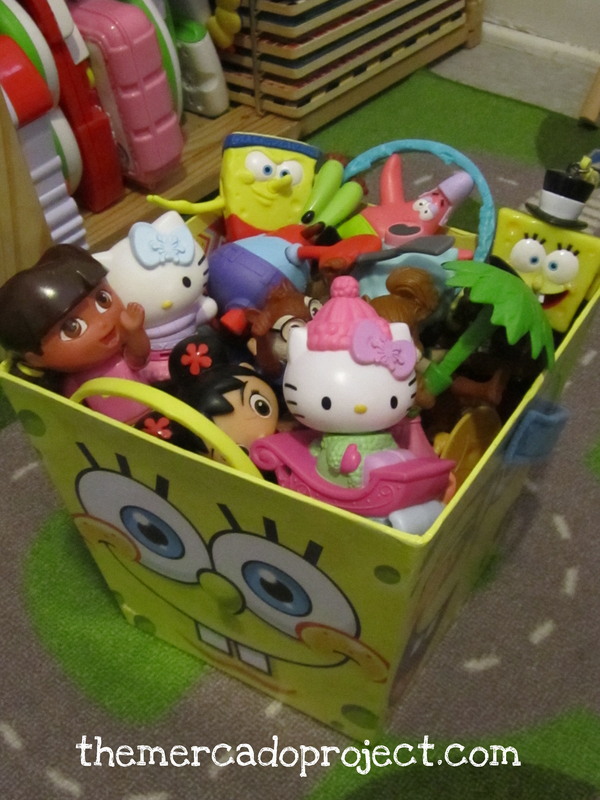 I emptied out the first toy bin, and yup Sophia was there, sorted and cleaned the keepers and without her noticing, of course, tossed a few broken toys into the garbage. I’ve learned from the past when you throw away toys, make sure they’re not visible or else meltdown city will occur even if the toy is broken. I’m very grateful that my kids have such items, especially since many of these toys were gifts, but sometimes you simply have to say we have too many toys. That’s why I’m teaching my oldest to consider donating some of her toys to kids less fortunate. We did it last year. We went through her stuff toys and I asked her which toys she wanted to keep and which toys she wanted to give to other little kids. She did very well. There were absolutely no tears, and when her father came home, she told him all about it with a smile on her face. Since she’s a year older and smarter, I hope she’ll donate more because Christmas is just around the corner, sorry but it is, and more toys are coming into this household. I can’t put a stop to it because the grandparents are big spoilers! !